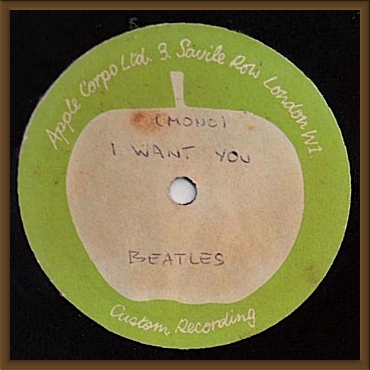 Now HERE is an incredible Beatles collectible, an original UK Apple Records 10" Acetate (one sided) of an alternate version of "I Want You." Ken Scott, the legendary record producer and Beatles engineer told me the following about Beatles acetates: "Back in those days there were no cassettes, DATs or CDs and so the main way for artists and producers to be able to listen to something at home was through playback acetates. The number required varied. As did the persons receiving them. It could be producer, artist, arranger, publisher, DJ or sometimes even a promotion guy." As this was a "work in progress" acetate, very few would have been made, only for the Beatles members and their very inner circle. An extraordinary opportunity !